A native of Franklinton, Louisiana, Leo Bankston was employed by the Baton Rouge Water Works Company for more than 46 years, retiring as a Vice President and Superintendent in 1983. 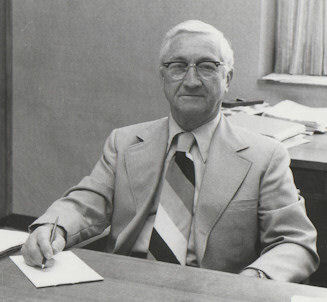 He was instrumental in the formation of the Capital Area Ground Water Conservation Commission and served as the Commission’s first Chairman in 1975. A board certified engineer and land surveyor, he served as Chair of the Southwest Section American Water Works Association, President of the Baton Rouge Chapter of the Louisiana Engineering Society and Chair of the Baton Rouge Gem and Mineral Society. He was a long time member of the Louisiana Conference on Water Supply, Sewerage and Industrial Waste, which named their own Chairman’s award after him. His forceful leadership in all his endeavors earned him the sobriquet of the "Little General." He passed away in October of 2003. Site copyright 2016 Capital Area Ground Water Conservation Commission. All Rights Reserved.